National Design Editor with The Times of India Group, Manoj Bhramar was earlier associated as Creative Director with Marie Claire, India, and worked with Marie Claire, France team in Paris. Prior to that, Bhramar was the National Art Director of The Indian Express Group. The former art director of the Hindustan Times and Outlook magazine, he started his career with India Today and Cosmopolitan. Within the span of 24 years of his career, he has been awarded prestigious awards including the IFRA award for best newspaper design for 2006 for the Hindustan Times. Apart from his expertise in print media, Bhramar has also designed the signage work for the Indira Gandhi National Museum in New Delhi, designed the trophy for the Ramnath Goenka Journalism Award by the Indian Express Group, as well as other commissioned interior design assignments. Bhramar is also a sculptor and painter and has had two solo shows. Vibha Galhotra is a New Delhi-based conceptual artist whose large-scale sculptures address the shifting topography of the world under the impact of globalization and growth. She sees herself as being part of the restructuring of culture, society and geography – of New Delhi, and the world. Responding to rapid environmental changes and re-zoning of land, her work crosses the dimensions of art, ecology, economy, science, spirituality and activism. Galhotra works in varied mediums through photography, animation, found object, performative objects, installation and sculpture to create experiential spaces. 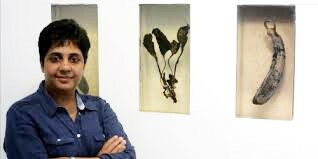 She was the Resident Fellow, Bellagio Center at The Rockerfeller Foundation and the Asian Culture Council Fellow, and has exhibited her work in India, the United States, Australia, Germany and Mongolia. Leonie Muldoon is Minister Commercial at the Australian High Commission in New Delhi, responsible for trade, investment and the business of education across South Asia. Being a lawyer by profession and a corporate executive by trade have been a means to funding her passion for art. Argha Kamal Ganguly specializes in painting but also explores other mediums and fields of creative expression. He is currently serving at the National Gallery of Modern Art, New Delhi, as an Assistant Curator. Here he engages viewers from different age groups, as well as students and teachers through workshops and storytelling sessions which help to encourage interest in NGMA's collection. Being part of the curatorial team, he is also involved in the process of planning, mounting and organizing exhibitions and other educational and outreach programs throughout the year. He is also engaged on a part-time basis as Guest Lecturer at the College of Art, New Delhi, and the National School of Drama. Born 1991, he pursued an M.F.A. (2014) from Rabindra Bharati University, Kolkata. Devyani Sahai is an art professional with 18+ years of experience in design, promoting and teaching art across schools, and working with NGOs. She has worked in the entire gamut of art - from teaching and designing course content to coordinating art events both for internal and external exhibitions. She currently manages one of the premier art spaces of Delhi, Ojas Art, as Associate Director.